Sometimes you just need someone singing to you. And sometimes, you don't want them to be singing about something pleasant. When I feel like that, I reach for my Flashlight Seasons - a haunting, very pleasant album that I think anyone can enjoy. Gravenhurst has put out a few other records, one of which I have (Internal Travels) and enjoy very much. That album showcased the songwriting and guitar melodies Nick Talbot is capable of creating, and Flashlight Seasons expands upon those ideas with more lush instrumentation and more aggressive multitracking. I'm not sure whether I can say for sure that it makes the album less intimate, but certainly it isn't as if he's just there in the room anymore. The somber tone hasn't changed - Talbot's writing is reflective, filled with ghosts and darkness, and while much of the album moves in minor key, it isn't a funeral march - just a bit grim on the whole. The first track may be my favorite from the album and I am providing it, though it isn't quite representative of the rest of the songs. The voice is in rare character and percussion and instrumentation is denser on this track than the others, but it's a great song and it gives a general idea of what to expect. The album flows well and it's difficult to pick the best songs out, though "Bluebeard," "The Diver," and "Damage" play a bit more for me. 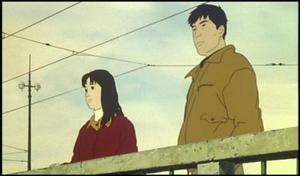 "The Ice Tree" is a problem for me - I like it but I find it sort of theatrical and slightly forced. In any case, the album is well worth your time, as is their earlier LP and probably their newer EP, Black Holes in the Sand. They have a new album coming out in the Fall according to the scanty information on their website, so keep an eye out for it and tell me when you see it in stores. 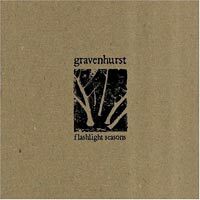 As for you infernal downloaders, eating up my bandwidth, here is "Tunnels," from Gravenhurst's Flashlight Seasons. It's bothersome to me as a collector of music that when recommending something and being asked what it sounds like, many of my favorite records have no close relatives and relating them to an inferior or inadequately similar artist seems to do my recommendation a disservice. Case in point: most of the albums I have mentioned here on this site. 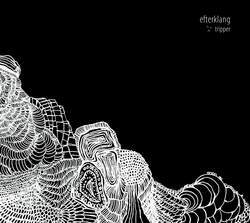 Case in point, more precisely, though, is Efterklang's album "Tripper". Its combination of electronic tomfoolery, lush organic instrumentation, and dreamy vocal stylings are resistant to comparison or even description. One of my favorite things about many of the albums I have collected is their shape-shifting, genre-biting wile, but to my dismay it makes them all sound sort of indistinct upon explanation. So take that to heart, and my words with a grain of salt, but know that all I recommend is good, and anyhow it doesn't hurt to click and listen. Efterklang maintain a certain sound throughout the record, a sort of glitchtronica crossed with chamber orchestra, plus murmured, unintelligible singing throughout. The group is danish, perhaps from Greenland, so some of what you hear is in that language, but I distinctly heard them say "We're the go-between, the broken shields, we're the streaming hills," so even if you do hear their words, you will be baffled anyway. Many of the tracks contain no percussive instruments, but instead rely on an electronic snapping, a sort of CD-skipping noise which I thought at first was damage to the media but witnessing its constant matching to the beat, I learned it was their replacement for that most striking of instruments, the drum. I grew accustomed to it immediately and it's really a satisfying backdrop for the rest of the sounds, and it isn't just set to snap and left - it's a dynamic thing, more like their own special instrument than a gimmick. The vocals come and go, frequently a male and female voice simultaneously, whispering a nugget of unearthly poetry in your ear and then receding like a ghost. There are also real instruments to be found: guitars, glockenspiel, strings, and doubtless others, which accompany the voices or alternate with them, adding depth the the sound and bringing it back to earth a little. To tell the truth, that's more or less what the album sounds like, which is not to say it all sounds the same, more just that those are the tools they are working with, and I'm out of coffee so I don't feel like describing any songs in detail. 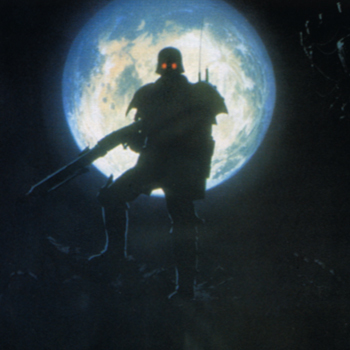 It's fair to say, however, that the track I'm providing is more or less representational of the rest of the album. Here's "Step Aside," by Efterklang.